If you are looking for information on the SprayGreen Lawncare franchise business opportunity, Spray Green Lawn Care franchises or Spray Green Lawncare franchising, then you have come to the right place. 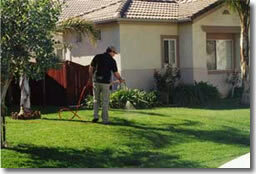 SprayGreen Lawncare Business Can Offer You. 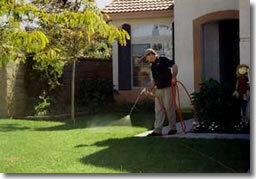 SprayGreen Lawncare Service offers you a truly amazing business opportunity. If you've ever wanted to be your own boss, have unlimited income potential, and be free from franchise fees and monthly percentages, then a SprayGreen has exactly what you're looking for. SprayGreen is looking for those who truly enjoy being outdoors, and who are interested in doing their part to make the landscape healthier and more beautiful. You can make your new business a part-time job or full-time career - it's completely up to you. SprayGreen simply puts the tools for success in your hands! Approximately 29% of the homeowner population uses a professional landscape service in some fashion or another; this has created a nearly three-and-a-half billion dollar a year marketplace. Homeowners have become more environmentally conscious, opening the doors to new methods of lawn care. They've also changed the way we look at the traditional means of caring for our greenery. This market is continually growing, not only among homeowners, but also with retail and commercial property owners who must keep their landscapes plush and looking as good as possible. At SprayGreen, we believe that you deserve to keep the money you earn. So, there are no monthly fees of any kind - no franchise fees, no monthly percentage or royalties. There are no hidden taxes or costs we surprise you with. That's because SprayGreen makes its money only on the "juice" - the liquid fertilizer which distributors buy directly from SprayGreen. Our product is sold exclusively thru SprayGreen and only to distributors. So, when we say that our distributor's success is our success, we mean that - literally. After all, if you're not getting accounts and spraying people's lawns, then you won't be buying the fertilizer, which means that we won't be making money either. 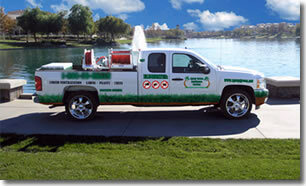 No Previous Experience is Necessary to Own a Turnkey SprayGreen Business! Complete Training and Unlimited Support: No previous experience is necessary! Marketing: Our marketing is proven successful, and we share our techniques with you so that you're able to develop a loyal customer base of homeowners and commercial accounts.